In life, there are things that you need to have and there are things that are nice to have. You need basic things like food and shelter–we can’t survive without them. On the other hand, luxuries like cell phones and elevators fall into the category of nice to have. Sometimes we feel like we need them–but we wouldn’t die without them. 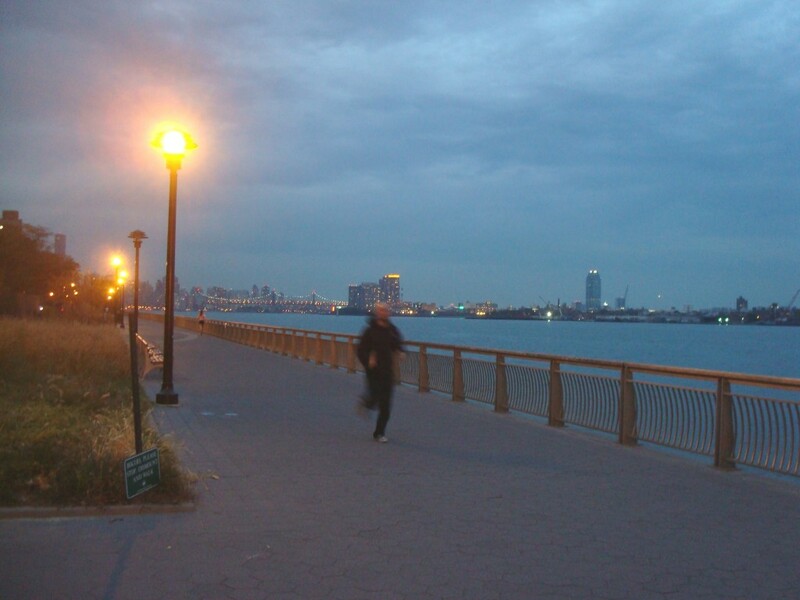 In running, the only thing that you really need is your body itself. For me, that simplicity is part of the appeal of running. Hopefully you have a body already, so let’s focus on some of the other things, the ones that are nice to have. Afterall, there is nothing wrong with having nice things. 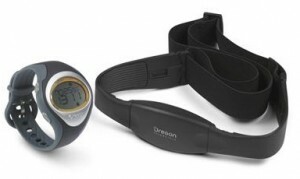 Heart rate monitors typically have two components: a wristwatch and a chest strap. Heart rate monitors allow you to gauge your intensity by telling you your average heartbeats per minute. This can be be helpful if you have a tendency to sell yourself short and not push yourself hard enough. 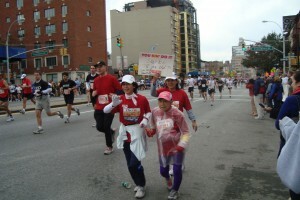 It can also be helpful if you are bad at pacing yourself and push too hard at the start. The biggest drawback of wearing a heart rate monitor is that it can be uncomfortable, especially during longer runs. They often have an elastic band that wraps around your torso, which can get sweaty and start to feel heavy after several miles. Many heart rate monitors have other features as well, like calorie counters (which don’t always give accurate readings). While heart rate monitors have their pros and cons, I think that they are overall a worthwhile accessory and can be a valuable performance tool. There are other means to track your intensity (like a simple wristwatch, for example), but the heart rate monitor is probably the most reliable, without being too much of a hassle. 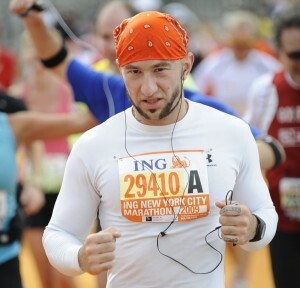 Running the NYC Marathon was such an overwhelming experience. Just getting from my apartment in the East Village all the way out to the start in Staten Island was an ordeal all in itself. My day started at 5am when I got out of bed and immediately started drinking water and eating bananas. I wanted to be sure I was hydrated and had lots of potassium in my system. Plus I love bananas! By six I was already out the door and on my way to the train to catch the 7am ferry to Staten Island. After the ferry ride, there was a shuttle bus to the check in area. 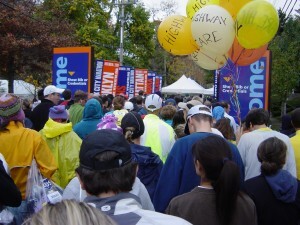 Then I had to check my bag, wait for a porto-potty and find my way to the start corral. By the time I got there it was already 9:30. Even though at times it was disorienting or frustrating due to the incredibly large crowd (over 40,000 entrants! 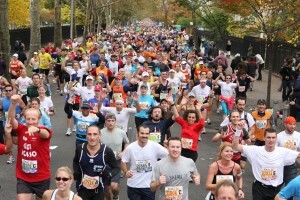 ), the New York Road Runners did a great job organizing this amazing event! Thousands of us waiting in line to check in. The race itself was incredible. The excitement of the crowds, the support of friends and family, and the beauty of the city itself all served to make for an unforgettable experience. The highs were some of the most amazing moments of my life, the lows were among the hardest. 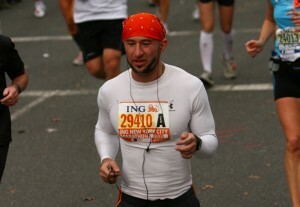 I felt great for the first 3 hours of the race but around mile 19 or 20 my legs started to feel very fatigued. My original plan was to finish in under 4 hours, but I knew I couldn’t keep up a 9 minute mile pace any longer, and if I tried I would be asking for trouble. At that point the game plan simply became to finish the race. From then on I knew that no matter how much pain I was in, even if I had to crawl, I was not going to stop until I crossed the finish line! I finally made it at 4:22:11, which averages out to almost exactly a 10 minute mile pace. 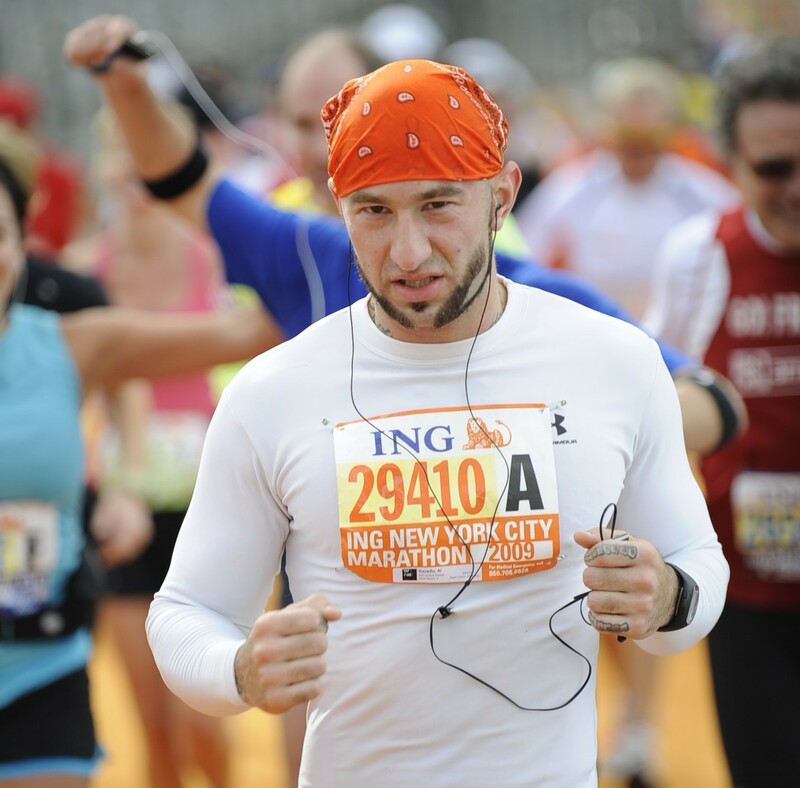 Crossing the finish line was an unexplainably exhilarating feeling, but it was soon followed by one of the worst feelings in the world. 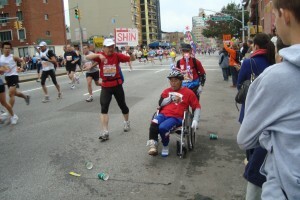 When you finish a marathon it hurts to walk, but the only thing that hurts even more than walking is having to stop and stand. And that’s exactly what you have to do for a good twenty or thirty minutes while everyone is huddled together trying to get their bags, take photos, and meet with loved ones. But overall it was an absolute blast! I definitely plan on doing another marathon at some point, but I think my next race is going to be a 5k. It’s been raining a lot lately here in NYC. With the marathon looming two weeks away it’s got me thinking about what it would be like to have to run it on a day like today. This past spring I ran in the NYRR Scotland Run. 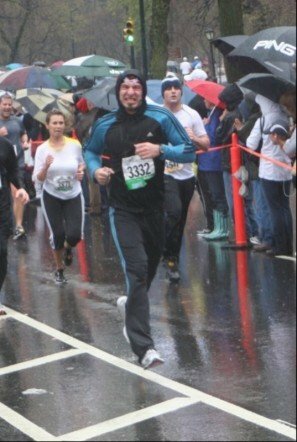 It was a miserable rainy day like today but I gave it my all–and at least I got this great souvenir photo out of it!